Time of Writing: Night was written in Paris in 1950. 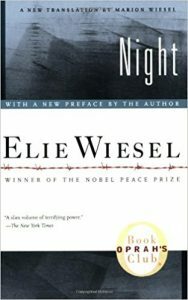 The author had previously taken a ten year vow of silence, wherein he would not speak of the Holocaust or what happened. Point of View: Narrated in first person by Eliezer. Eliezer discusses the autobiographical events of the book from his own perspective. Themes in Night: The main character’s struggle to keep his faith and his belief in God; Silence, or the unwillingness to fight back; The loss of humanity; The true importance of the bond between fathers and sons.